Ramon J. Romero, 94, passed away on Monday, January 7, 2019 at Memorial Medical Center in Las Cruces, NM. He was born in Anthony, TX on August 18, 1924 to Jose Arebalo and Ponciana (Juardo) Romero. He was a lifelong resident of T. or C., NM where he worked as a Massage Therapist for many years. 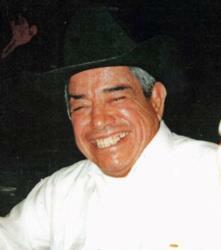 Ramon’s hobbies included dancing to his son, Tudy’s music at Pine Knot, and singing, playing the guitar and accordion with his family and friends. Ramon was dearly loved by many, and his happy, gregarious soul will be sorely missed. Survivors include his children – Patsy Romero, Tudy Romero (Patsy), Amy Romero, Mary Ann Romero (Jerry), Yolanda Grijalva Romero, and Jacobo Romero (Rosanna); 13/Grandchildren, 13/Great-Grandchildren, and 14/Great-Great-Grandchildren. He was preceded in death by his wife, Carmen B. Romero; and by his son, Gilbert J. Romero. Visitation for family and friends will be held on Friday, January 18, 2019, at 9:00 A.M. at Our Lady of Perpetual Help Catholic Church. Mass of Christian Burial will be held at 10:00 A.M. celebrated by Rev. Don Hyatt, CSB. Interment will follow at the Arrey Cemetery in Arrey, NM. Serving as Casket Bearers areTudy Romero Jr., Tudy Romero III, Adrian R. Widner, Alex Romero, Levo Barron, and Bobby Tarín. Honorary Casket Bearers are Alejandro Gonzales, Lucas Barrera, Baudelio Muñoz and Andres “Chacho” Widner. My sincere condolences to the entire Romero family. I have nothing but fond memories of playing music with Ramon & Tudy. I'll always remember the great music we played and all the laughs we shared. I will forever be grateful for the musical knowledge that I gained by playing alongside of you so very long ago. Tudy, I've always said that I'll never be as good as you. You're the best! May God grant you consolation in this difficult time and may Ramon rest in peace. Your friend always.